The Shady Ladies of Waynesville, NC are having their quilt show this weekend. There is a lovely variety of quilt styles, techniques and subject matter. Every year they have a challenge within the group and feature it at their quilt show; I especially loved their choice for this year. There were specific dimension requirements (12-15" wide), no borders and each piece to feature earth and sky in the artist's interpretation. There were so many beauties, I wish I could have included all of them but just to wet your appetite, take a peak and enjoy the show. This piece features a wonderful waterfall made by Roberta Bonham. Dot Burford did Hollyhocks, one of my favorite flowers. Christel Arnsberger did this wonderful sunset. Wendy Bowen did the birch trees below. This next quilt by Veronica VonZwehl tickled me as it featured fabric beads. We used to make this same beads out of magazine strips, way back when I was a Brownie. It brought back sweet memories. Close-up of the beads - way cool in person! And another quilt by Veronica - part of a lovely assortment of nature themes I saw, trees being very popular. These funky, fun trees by Winnie White. This next piece was made by Jane Cole for a show in Europe. I know it won a big prize. This next quilt was one of my favorites made by Chris Kroot. I think it reminded me of my growing up years on Long Island and Jones Beach - the sand dunes and wind erosion fences. and the amazing beach grasses. Hope you enjoyed the "mini" show. Years ago when my mom was alive and living in North Palm Beach, Florida, one of our favorite things to do was to drive over to Worth Avenue and visit the Lilly Pulitzer store. It carried her line of clothing and HER FABRIC. We couldn't afford her clothing but we always splurged on fabric. These beautiful hand screened fabrics in bright colors were so luscious, I never wanted to cut them - just look and touch (I'm so over that now, I cut everything). But back then, I saved and hoarded my stash of "Lillies". Over the years, Lilly Pulitzer clothes and accessories lost their popularity and my own stash of Lilly fabric worked its way to the bottom of the pile, way back in the closet. Recent shopping trips have revealed a new resurgence in "Lilly", so searching in my closet uncovered many gorgeous pieces of fabric. and sometimes it was almost hidden. Can you find it below? like in the veins of this leaf . I plan to make some very simple things for summer - skirts, shorts and jackets. It will be a bright summer, I'm thinking. Last night I had great fun presenting a program to the Western North Carolina Quilt Guild in Hendersonville, NC - a lovely group of women with lots of talent. I was taken to dinner at the Inn on Church Street in downtown Hendersonville. It was lovely and the food delicious. The Inn is celebrating its 90th year in business. 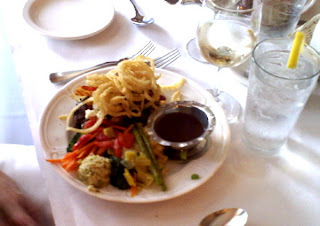 That's Filet Mignon buried underneath those onion straws. I arrived at the meeting, settled in to get ready for my favorite part - Show and Tell, when I realized I forgot my camera - boooo on me! Needless to say, I have no pictures to share of this talented group of ladies but I do have a cute quilt story that came out of the evening. My presentation was on "Inspirations" and what inspires people to make the quilts they do, followed by a small trunk show of my quilts and the inspiration behind them. One of the quilts I showed was created for an invitational show I was involved in a while back. 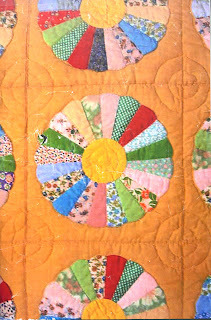 For the show Quilt dialogues/Vintage Inspired Art Quilts, each artist was given a picture of a vintage quilt. We were to create an art quilt using inspiration from any aspect of our "vintage quilt". It could be color, pattern, name etc. it was wide open. I was given a picture of a 1930s Dresden Plate, very bright pure colors done in the very traditional pattern of the Dresden Plate. I went to a home improvement store to get paint chips to match up to the colors in the pictures that was to be my inspiration. 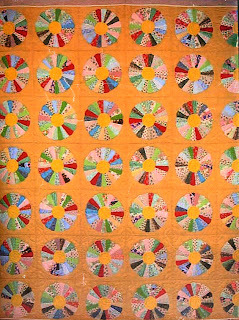 I then dyed fabric to match the colors in the quilt and also filling in with some "vintagy" looking prints. 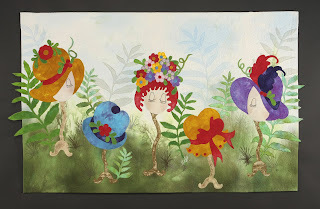 I scoured my tole painting books from years ago as I wanted something whimsical; I found some adorable hat designs by Jo Sonja. I changed them around so they were part of a garden, added Dresdan Plate flowers, squiggles, my own touches and came up with "Dresdan Hat Garden". As I was showing this quilt and telling the story behind it, a voice from the audience said "that was my grandmothers quilt" Say that again I replied." Really, that was my grandmothers quilt" I said you mean your grandmother made one just like this one. No, she said, that quilt WAS my grandmothers quilt. Well, knock me over - how exciting to meet Pat Childress, the grandaughter of the maker of this Dresdan Plate. 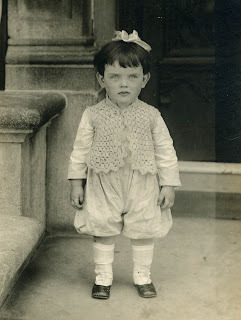 Pat told me her grandmother was Nellie Pitt Holland; she was a professional garment seamstress from the age of 15 until 85 and lived to be 96 years old. Pat went on to say how she had loaned this quilt to be part of the exhibit, saw the exhibit but never met the maker of the "Inspiration quilt". What a nice moment and what a small world it really is and thanks Pat for sharing that little piece of history with me. Years ago, I took a weeklong workshop with Karen Berkenfeld - an amazing fiber artist whose main focus was printing on fabric. I've been cleaning out and found some blocks from her workshop. I've been wanting to use up some of the fabric I've created over the years. These blocks incorporate many different kinds of printing including monoprints, carved blocked printing and laying fabric over objects for relief printing. On some of the blocks, I used a dry paint brush and applied paint to dry cloth for an interesting brush stroke affect. The dark lines in the block below are where the fabric was laid over corrugated cardboard and a brayer with black paint run over the top. I also discharged circles by dipping a tray, recessed with circular openings (looked like it held candy) into discharge paste and stamping on fabric. I like the dry brush painting which uses little paint so much of the base fabric shows through. I wanted to do some screening on top. I like words and in my search for something appropriate, I came across my grandmothers "cookbook". This is a cookbook of the 1940s, when during the depression, people didn't have extra income to buy cookbooks. They improvised and made their own. To this day, my favorite recipes are those from friends and social gatherings. And this is my grandmothers - her favorites from friends and church suppers. The pages note who it's from, how many it serves, where she had it AND ALL in her handwriting - even better! There are also clippings from the paper, all yellow and aged. One caught my eye - "Cherry Winks". What a great name for a cookie. So I made a screen of the recipe on my Gucco machine. I like the way the tape runs down through the recipe. I'll be using this to screen on some of the blocks. So far, it's gone together fairly easily, still more to do but will keep you posted. I've been out of town and out of touch - first in Florida and then New York. My sweet mother in law - Hilda, passed away a little over a week ago. She was 90 and had great quality of life until almost the end. She was a wonderful mother in law; I was blessed. She died in Florida but was buried in NY with her husband. It was a whirlwind of a week, a roller coaster of emotions and despite sad circumstances, good to see family again (some we haven't seen in 30 years). This is one of my favorite pictures of Hilda - just 2 years old. What an adorable little girl and outfit - especially the shoes, Ohhh those shoes. We are back home, studio up and running again and I'm anxious to get sewing. Will be in touch real soon. One of the earliest signs of spring in Asheville, NC is the outdoor markets reappearing in April and staying until December. It's a very happy way to spend a Saturday morning. Lots of people with their dogs, children in strollers, free samples to nibble everywhere. I love going and picking out my treat for the week but also to pour over the beautiful colors and textures of fresh veggies and flowers. The Charlotte Street market is my favorite. I always seem to bump into someone I know and they have my favorite vendor, Annie who makes the most deliciously silky handmade soap. and have you ever seen so much asparagus in one place? This is one of my favorite vegetables - had to bring some home. I loved this booth with so many different greens, creams and red and such wonderful textures. I also love the old fashioned calico cloths to display the veggies. It looks like something out of the Andy Griffith show - remember that (or am I dating myself)? And you just never know when you'll run into an Angel! One more stop before going home and WOW - what color. 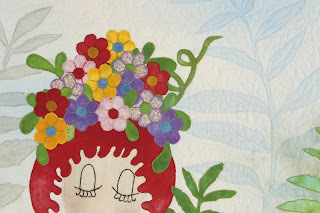 It made me want to run home, pull out all my brightly colored fabrics and start a new quilt. You can't beat Mother Nature! Hope you had a great Saturday.